I have an exciting little announcement today, and I decided to do it with a vlog! And because no vlog is complete without commentary- I think that when I was summarizing the webinar discussion I was putting in some of the stuff from the chat box because I couldn’t find the whole part that I was talking about when I rewatched it. Or I just made it up. You should really just watch it because they get the point across a million times more eloquently than I do. Hopefully I make a tiny lick of sense. And please tolerate the fact that I seem to skip thoughts mid sentence. Here’s the scoop in case you don’t want to watch the vlog. On Wednesday I was really inspired by the Business with Heart webinar, and through some of the discussion I came to the realization that I need to spend some quality time focusing on my own creative endeavors without being influenced by all the stimuli that I surround myself with daily in blog world. I’ve come to the same realization a couple of times in the last few months, but this time I really felt inspired to do something about it. Next week I am taking all of the time that I usually spend reading blogs, curating content, and finding inspiration elsewhere and instead focusing on my creative interests and finding inspiration within myself. I’m calling this a creative cleanse. What do I want to explore in my sketchbook? What do I like? What appeals to me visually? What is my style? I am going to post something that I create on the blog every day. I’m going to be doing a bunch of different things between my sketchbook and designing digital things that I maybe don’t normally take the time to work on, but if you’d like to join in you can do whatever you want! Whether it’s painting, knitting, cooking… it seriously doesn’t matter, as long as you are pursing your interests because you have a passion for them and they are part of who you are. And don’t put a ton of pressure on yourself about the finished product- this is about the process. I would love for you guys to participate, and you can participate as much or as little as you want. You can blog about it, tweet it, instagram it, whatever! At the end of the week instead of including links in the Starred this Week post, I’ll probably do some sort of round up if people participate. So if you do participate, definitely let me know because I want to see! 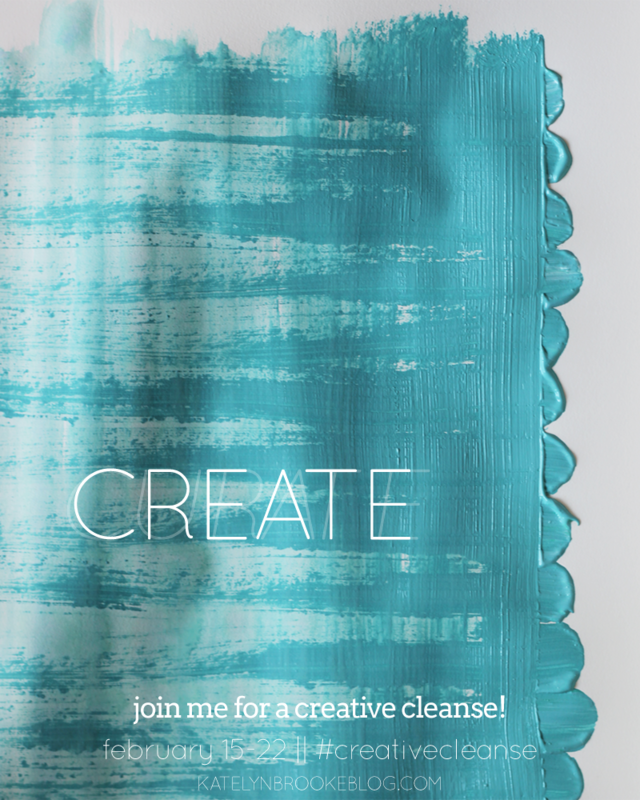 While I won’t start posting until Monday, I’ll be working over the weekend and documenting my process on Instagram (and Twitter) with the hashtag #creativecleanse. Do you have this same problem? Join in and tell me what passions and creative interest you might pursue! I agree a hundred times over. I would love to join you! This can be like an arts & crafts show & tell. I love seeing other people’s creative process too. So interesting! Great idea, Kate. Yay, I’m so excited! Thanks Janelle! Yes! Great idea, love this. It helps you stay original too. I have had to really limit my time perusing through different blogs and pinterest. This is such a great idea! I’m definitely in! I’ve been collecting paper scraps for a sketchbook that I’ve yet to start, so this might be the perfect opportunity! And I have 2 scarves half finished that I should probably complete. What a lovely idea! I have been working on my own creative project in fits and starts. This will give me the inspiration to sit down and DO IT. Thank you, Katelyn. Katelyn! I just came across your blog through a pinterest pin (google fonts!) and I adore your work! Oh my gosh, wish I would’ve found you earlier! Creative clenses – such a great idea. I might just try one myself! Desperately needed! I can’t wait to see your posts for this. I sometimes take a full week off of blog reading, but it’s mostly just to watch lame tv because I am so tired and my brain can’t handle anything else (ahem, last week). I love your idea of intentionally creating during that time. Anxious to see how your experiment goes, and hopefully that will spur me to try my own! This is a great idea! I just wish I could stay focused enough to work on something, but I’ll probably try to catch up on scrapbooking. Hi Kate, great post! I tried to take a look at the webinars you mentioned but they seem to be 404ing. Do you know why? Thanks Melissa! Really? I just played one of them for a few seconds and it looked like it started okay- maybe there was just a glitch when you were looking? I see it now durr, thanks! This sounds great! I need to stay off Pinterest and blogs and get some of the ideas in my head out in my sketchbook or started as projects. I think it’ll be fun, and almost like therapy. This is a good week to do this for me, my long-arm quilter is down and I need something to take my mind off of it! Yay! I hope it turns out to be inspiring for you- I already feel like it’s been a good exercise for me! Kate, you’ve inspired me! I can very much relate to what you touch on in your video. I often get into a rut looking around at what other people are doing, on blogs and all the other media out there, then find myself becoming unfocused, distracted and on bad days, bummed out. When I can get back to what I know with my gut is the source of my own creativity, the thing that drives me to do what I do; cook, create recipes and use my camera to communicate where I’m coming from, it’s like a magical re-centering. Today I went into my home studio, which has been a cluttered mess since last summer, rearranged everything and cleaned it up. In the process of that, I feel like I have a fresh new space to work in, even though it’s still the same old one, a sunroom off my living room. Just doing that sparked something — I literally sat down with my notebook and the ideas flowed out. Thanks for the kick in the a**! I look forward to hearing how the week goes. Your surroundings can have such an impact, and I’m the first one to forget that! My desk is often a mess and I feel so much better when it’s clean- maybe I’ll spend some time doing that today! I’m glad this was inspiring for you, Karen! Oh YES YES YES. I am going to join you on this. I’ve been needing to find what inspires me in my daily life, and instead I end up regurgitating bits of art I’ve seen on other artists’ blogs. This is amazing. I’m a few days late but I’m joining in now! I’m on instagram at @audreeeeeey (6 e’s) and on Twitter at @audreytheturtle. Also I’m a follower of your blog now, too. Glad to have found you! I think this time of year is particularly uninspiring – pale landscapes, short and gray days. It’s easy to spiral downward. I’ve found your method of ‘creative cleansing’ to be the most effective and now it’s nice to have a snazzy hashtag to go with it. A friend of mine started the #Craftup2013 idea and it’s been a fun way to be re-inspired and creatively challenged – http://getsmeeverytime.com/2013/01/the-great-craft-up-gets-me-every-time/. Kelly’s idea is to use up supplies instead of buying new stuff this year. This is such a great idea! I spend so much time going through my feed trying to read everyone else’s ideas . I definitely want to do this, but I will have to start Monday since my blogging posts were already scheduled. I love this idea! I’m just sorry that I’m discovering it too late to join in your week. I may make my next week a creative cleanse week. I find I get blocked from starting things for fear of them not turning out as I hoped. Or I don’t finish them for the same reason. You’ve inspired me!